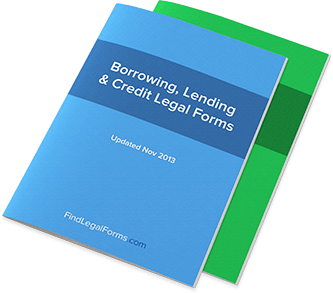 Borrowing, Lending & Credit Forms. Save on attorney fees. Various legal agreements and documents that record and facilitate legal transactions for you or your business. Borrowing, Lending & Credit forms are used by individuals or businesses during financial transactions involving borrowing or lending money. They cover everything from making the loan, collecting on the load and making modifications to the terms of the loans. Used by financial institutions to acknowledge or authorize financial transactions and more. For use when attempting to legally collect a debt including assignments and appointmenst to collections, demands for payment and settlement agreements. Forms and letters for use when repairing your credit, establishing a credit line, or inquiring about a credit history. Credit related letters that fit a variety of financial transactions including irrevocable standby letter of credit, indemnities and authorization letters. Notices designed to assist in borrowing and lending transactions. Forms used to postpone, extend or release the repayment of a loan or debt. Various documents used in many financial transactions to provide security in inventory or other assets. Promissory Note - Balloon Payment Installment Promissory Note with Final Balloon Payment. Promissory Note - Installment This note is used when one person (Lender) lends money to another person (Borrower). It provides for installment payments until it is paid off. Promissory Note - On Demand Used when one person (Lender) lends money to another person (Borrower) and allows the Lender to ask for the money back at any time. Promissory Note - Term Promissory Term Note requiring principal and remaining interest to be paid on a certain date. Vehicle Bill of Sale and Promissory Note Used for the sale of a vehicle like a car, van, truck or trailer with installment payments. The vehicle can be sold "as is" or with a warranty. Trust Indenture This Trust Indenture is between a company who issues bonds and a trustee who will represent the company's interests (usually a financial institution). Appointment of Collection Agent Appointment of collection agent to collect on a delinquent account for use in all states. Assignment to Collections Assignment of account for collection letter. Collection of Payment Letters Collection of Payment Letters for use in all states. Letter from Debtor to Collection Agent Letter from debtor to collection agency to limit or cease communication. Debt and Credit Handbook This Ultimate Debt & Credit Handbook contains information, forms and letters to manage and repair your credit. Notice of Business Credit Application Approval For use when approving a credit application. This notice will inform an applicant that their application has been reviewed and approved. Employee Assignment of Wages This Employee Assignment of Wages will effectively assign an employee's wages to a creditor. This assignment must be signed by the employee in the presence of a witness. Illinois Assignment of Account for Collection Assignment of account for collection letter for use in Illinois. Letter of Credit Letter of Credit which establishes a credit line in a specific amount. This letter also sets out the term and amount of the letter of credit. Bridge Financing Term Sheet This Bridge Financing Term Sheet is for use by an individual or entity who agrees to finance a company in exchange for common stock. Forbearance Agreement - Long Format This Forbearance Agreement (Long Format) is for use by a borrower and a bank who will agree to postpone exercising its rights and remedies under a default. Postponement of Claims Agreement Agreement where a creditor of a corporation agrees not to be repaid on any claims until another creditor is repaid. Postponement of Debt Agreement Agreement where a creditor of a corporation agrees not to be repaid on a specific debt until another creditor is repaid. Postponement of Debt Agreement - Interest Payments Permitted Agreement where a creditor of a corporation agrees not to be repaid on a specific debt until another creditor is repaid. Promissory Note - Installment (w/ Spanish translation) [Spanish Form] Installment Promissory Note for use in most states (Pagaré –Pagos a plazos aplicable en varios estados). Promissory Note - Secured (Installment) Allows a party to make a loan, to be paid in installments, secured by property. Promissory Note - Secured (Multiple Options) Allows a Lender to make a loan, with multiple repayment options, secured by property. Promissory Note - Secured (On Demand) Allows to make an on demand loan secured by property. Promissory Note - Secured (Term) Note which allows you to make a loan secured by property and which must be repaid by a certain time. Release of Promissory Note Document which releases a party from its obligations under a Promissory Note. Security Agreement - General This Security Agreement is designed for use in all states. This legal form is available for immediate download. Set-Off Agreement This Set-Off Agreement is for use when two parties agree to set off indebtedness owed to each other. This agreement can easily be tailored to fit your unique needs. Guarantees & Indemnity Agreement Forms Combo Package Get 8 forms for just $39.95. Save 75%! Save Money with this combo package containing all of our most popular Guarantees & Indemnity Agreement forms Letters of Credit Combo Package Get 2 forms for just $7.99. Save 47%! Save Money with this combo package containing all of our Letter of Credit forms Postponement, Extension & Release Forms Combo Package Get 9 forms for just $39.95. Save 78%! Save Money by getting all of our very popular Postponement, Extension, and Release forms together in one convenient packet. Security, Priority & Subordination Agreement Forms Combo Package Get 11 forms for just $39.95. Save 82%! Save Money by getting our very popular Security, Priority & Subordination forms together in one convenient packet. Credit Repair Forms Combo Package Get 13 forms for just $39.95. Save 52%! Popular Our very popular credit forms together in a convenient packet. Authorizations, Confirmations & Acknowledgments Combo Get 4 forms for just $39.95. Save 50%! Save Money with this combo package containing all of our most popular Authorizations, Confirmations, and Acknowledgments forms Assignment & Novations Combo Package Get 12 forms for just $39.95. Save 83%! Save Money with this combo package containing all of our most popular Assignment & Novations forms Promissory Notes Combo Package Get 11 forms for just $39.95. Save 78%! Our very popular Promissory Notes forms together in a convenient packet. Borrowing, Lending Premier Combo Packages Get 9 forms for just $39.95. Save 78%! Many of the frequently used forms in the borrowing and lending market. Forms include guarantee of specific debts, subordination agreements, collection letters and promissory notes. What are Borrowing, Lending, and Collections forms? Although the three individual topics sound too big for one form – or even a combination of forms – to address, this is not only possible but for many people a necessary part of doing business. There is no single “Borrowing, Lending, and Collections” form that will address all issues that the title might suggest, but there are a number of legal forms that fall under the “Borrowing, Lending, and Collections” umbrella, ranging from Letters of Credit to Promissory Notes. The key to understanding Borrowing, Lending, and Collections issues as they relate to using common legal forms it to understand many of the individual forms and how they’re best used. It’s also to remember that these tools are often a necessary aspect of borrowing and lending if you want all of your agreements to receive the full protection of the law. What are some common Borrowing, Lending, and Collections forms? Notices: Ranging from the Notice of Dishonored Check to the ever-popular (for borrowers, at least) Notice of Final Payment of Account, notices are an integral part of the borrowing and lending journey and can handle both expected payments and unexpected hiccups along the way. Many notices also play a prominent role in the ever-unpopular Collection process. Letter of Credit: Establishing a credit line with a specific amount, this form is not necessarily as common as many loan and borrowing forms but can still be very useful from both perspectives if a credit line needs to be drawn for some specific purpose. Of course, to really do all Borrowing, Lending, and Collections forms justice, it’s important to get into the details of each form – as well as acknowledge the dozens upon dozens of other relevant forms that exist. If you have a question about a specific form, be sure to refer to the information displayed on its relevant page. How do I know which form to use for my purposes? This is the million-dollar question for whoever is new to the world of Borrowing, Lending, and Collections. However, without knowing your individual and specific circumstances, a clear answer can’t be offered. If you don’t have a specific idea in mind, it might simply be best to download Borrowing, Lending, and Collections combination packages in order to ensure that the contracts and forms you will need are available to you. From there, you will be able to examine the individual contents of each form in order to see how each might best apply to your specific situation. What about postponements, extensions and the like? Of course, not every loan or payment plan will go off without a hitch. That’s why Borrowing, Lending, and Collections packages will typically also include forms that allow for postponements and extensions. Again, these forms do not have a one-size-fits all approach; instead, you’ll have to find the one that is relevant to your situation. For example, a loan extension agreement might work best for a large loan if you can get your lender to agree to its terms. Meanwhile, a Release of Interest in Security might apply to a different situation altogether. What if I don’t need to download a full Borrowing, Lending, and Collections package? You may not have to; you may be looking for specific forms tailored to your specific needs. If this is the case, you shouldn’t feel restrained at all – instead, find the individual form you’re looking to download and feel free to download it. It is worth noting, however, that downloading a combination package can often be a cheaper way of ensuring that you have all of the proper Borrowing, Lending, and Collections paperwork you may need in the future. No one can know your paperwork needs except you. I’m a lender, and someone hasn’t been paying me in a long time. How do I start the collections process? The best way to go about it from the perspective of someone new to the idea of collections is to download a combination package of all the forms and notices you’ll need along with a step-by-step guide to the collections process. However, it’s worth mentioning a few key steps to familiarize you with what you’ll likely be facing. First, you’ll want to make sure that you keep your borrower in the know with all the proper notices as soon as a payment becomes late. Continue to follow through with these notices until you have the authority (under the original loan agreement) to turn the situation over to collections; however, it will still be required that you keep the borrower “in the know,” so make sure you continue to issue the correct notices. This is a very elementary overview of the collections process, so be sure that you are aware of all of the steps necessary before you begin. As a borrower, what kind of forms should I be wary about signing? Because borrowing a lot of money can be an intense process, you should technically be “wary” about anything you sign during the process. Be sure to read through each form with a scrupulous eye; you’ll also want to know what kind of forms you’ll be expected to sign before you even begin the process so that nothing catches you off-guard. The more you keep yourself educated about your state’s laws, specifically, the better equipped you’ll be to handle any contracts headed your way. A Fixed-Rate Mortgage applies the same interest rate toward monthly loan payments for the life of the loan. Fixed-rate mortgages are more straightforward and easier to understand than Adjustable Rate Mortgages (ARMs). They are also more secure for the buyer, and are popular with first-time home buyers. Since the risk to the lender is higher, fixed-rate mortgages generally have higher interest rates than ARMs. For example, a lender can offer a 30-year fixed loan to a home buyer at a 7.0 percent interest rate. The loan is locked in to the 7.0 percent interest rate even if the market interest rate rises to 9.0 percent. Conversely, if the market interest rate decreases to 5.5 percent, you, as the borrower, will continue to pay the 7.0 percent interest rate. An Adjustable Rate Mortgage (ARM) does not apply the same interest rate toward monthly payments for the life of the loan. Throughout the life of that loan, the home buyer’s principal and interest payment will adjust periodically based on fluctuations in the interest rate. For example, a lender could offer a 30-year ARM loan to a home buyer at an initial 6.5 percent interest rate. During an adjustment period for the ARM loan, the market interest rate could rise to 8.0 percent, resulting in a significantly larger interest payment. Similarly, the market interest rate could decrease to 6.0 percent, resulting in lower interest payments. Annuity: An insurance contract that pays the insured person during his or her life, rather than paying a beneficiary after the insured person’s death. An annuity is a type of retirement plan. Asset: Anything of value. May be real estate or personal property. Personal property can be tangible or intangible property. Attachment: The seizure or repossession of property by a governmental agent. Generally, attachment is carried out by a county sheriff or the Internal Revenue Service. Codebtor: A person who is jointly liable on a particular debt, either because of cosigning on the debt, acting as a guarantor on the debt, or by virtue of being a spouse or partner of the debtor. Collateral: Property used to guarantee payment for a secured debt. Cosignor: A person who has also signed a loan or contract with another and who is jointly liable on the loan or contract. Contingent debt: A known debt with an uncertain value that has yet to be resolved by a court. Debts: A debt is an obligation of some type that is owed to another person or entity. A debt may be secured if collateral of some type has been pledged or if a lien exists against some type of property. A debt may also be unsecured if there is no collateral securing the debt. Debts may also be further classified as “contingent”, “liquidated,” “unliquidated.” See also contingent debt, liquidated debt, or unliquidated debt. ERISA benefits: Payments made to a person under a pension or retirement plan that qualifies under the Federal Employees Retirement Income Security Act. IRAs, KEOGHs, and many other pensions are ERISA plans. Ask your retirement plan administrator. Executory contract: A contract that is not fully completed, which has some obligation or action yet to be fulfilled. Expenditure: Money that is, or will be, spent by a debtor. Fee simple: Refers to full ownership. Fraternal society benefits: Group life or other insurance benefits that are maintained and paid to members by fraternal societies, such as the Elks, Masons, Moose, etc. Guarantor: A person who has agreed to guarantee payment on a debt should the original debtor fail to keep up on the required payments. Health aids: Items or material that a person uses to maintain his or her own health, such as a wheelchair. Health benefits: Payments made to a person under a health insurance policy. Income: Money that is, or will be, earned by a debtor. Insider: Any relative of an individual debtor. Insurance benefits: Payments made to a person under an insurance policy. Intangible property: Property that has no actual existence, such as stocks, bonds, copyrights, trademarks, etc. These items may be represented by some type of document, but the property itself has no physical existence. See also tangible property. Involuntary bankruptcy: A bankruptcy action that is instituted by creditors against a debtor who has defaulted on debt obligations. Joint tenancy: Joint ownership of property in which the owners of the property hold equal undivided ownership interest in the property and in which each owner has the right of survivorship (the survivor will automatically inherit the other’s interest on death). Judgment: The final determination by a court of the matter before that court. Judgment lien: A real estate lien that has been established by a court order or judgment. The lien is recorded on official records and generally must be satisfied before the property is sold. Liability: A legal obligation or debt. Lien: A legal claim against property for the payment of a debt. Life insurance: A contract under which an insurance company agrees to pay a specified sum to a beneficiary upon the death of the insured person. Matured life insurance benefits: Life insurance benefits that are currently payable to a beneficiary (because the insured person has already died). Motor vehicle: Any vehicle that is powered by a mechanical engine. Nature of lien: The type of lien: either a tax, judgment, child support, or mechanic’s lien.. Personal Property: All property, either intangible or tangible, that is not real estate. See also real estate. Possessory lien: A right to seize and sell property that attaches to the property by law, such as a moving company’s right to sell property that it has moved and which has not been paid for. Possessory non-purchase money debt: A debt that is incurred other than to purchase the collateral for the debt, and for which the creditor obtains possession of the collateral, such as a loan by a pawnshop for a pawned item. Purchase money debt: A debt that is incurred to purchase the property which is the collateral for the debt. Real estate: All land and any items that are permanently attached to the land, such as buildings. Secured claim: Any mortgage, deed of trust, loan, lien, or other claim against a property, that is in writing and for which the property acts as collateral. Secured debts: Debts for which the creditors have some form of security for their repayment, such as collateral or a lien. Security interest: A creditor’s right to possess property held as collateral, upon a debtor’s default on a loan. Setoff: The application by a creditor of other assets of a debtor to lessen the amount of debt, such as the application of a debtor’s bank account balance to a pay off a defaulted loan. Tangible property: Property that has existence, that may be touched. See also intangible property. Tenancy by the entireties: A form of joint ownership of property by wives and husbands only (only in certain states). Similar to joint tenancy with a right of survivorship, but for married couples only. Unliquidated debt: A known, undisputed debt that has not been the subject of a court action. Wages: The amount of money paid on a regular basis for work.